I have caught this and the winter fish during the very same month. So not to sure about that there is a specific season to capture them. This can be caught from April to December.... just not January to march. The winter squid can be caught October to June. So you can see that both seasonal fish can be caught in the spring and fall... and each in his specific season. Actually caught a few today, so this may be a Spring catch, in Feralas. This fish requires a fishing skill of 205 to cast and 300 to avoid getaways. The catch rate appears to be low, but this is probably skewed by the seasonal nature of when it can be caught, which is only between the Spring and Autumn/Fall equinox (roughly March - Sept). Actually, this is not true from what I've found as of the most recent patch. While your fishing skill does infact need to be 275-300 to avoid getaways, I have reason to believe that Blizz is no longer implementing a seasonal rotation for fishing. I have caught at LEAST 7 Winter squid as of 15 minutes ago, so I don't believe it has a specific season. As for the Summer Bass, I'm still waiting, but I'm sure with my trusty +100 lure, I'll be picking them up in no time! Good luck finding these fish for yourselves. But mid-January IS a good time to catch Winter Squid. A fine time to catch 7 of them or more. Also, it is a poor time to be fishing for Summer Bass, thus why you are "still waiting" on them. The lure isn't going to help. I wonder if March 21st will begin the raw summer bass season, currently lures are not helping.. I'm sorry, but 300 to avoid getaways cannot be correct. I'm at 358 and about 8 in 10 are getting away. You can't catch these past midnight. I was fishing for a few hours, before midnight I got 11/~180, past midnight I didn't get any out of almost 80 casts. Not a huge amount of data but pretty conclusive I think. edit: This doesn't appear to be true in the Bay of Storms, but it seems to apply at least in the other areas of Azshara. Just been fishing in Azshara in The Bay of Storms for about 2hours and caught 36 of these. Its now april and i caught no winter fish suggesting that the seasonal thing still applies. Why are these worth so much, given that the food buff they are a reagent for is not very impressive? Is it because they are needed to level cooking or something? the answer is yes they are used primarily to level cooking. i have many toons that needed either squid or bass to get high enough to do bear flank. i went to azshara and i farmed up about 5 bass in about 15 minutes using a bobble, my level altogether was 300. These items are currently still in-gam at the moment. Though keep in mind random is sadly random. Though they should indeed stil be obtainable. You may wish to try moving to different locations as someone might be scaring them away ^_^. So summer bass don't like Deathwing? Maybe they'll be fishable in new zones? Anyone been able to find a place to catch this one in patch 4.0.3 (after 27th of November) ? "The summer bass cannot be cought right now , is is only available during the summer months :)"
Sometimes you get newbi GM who know less then players and cant answer your question in right way. The last few guys that posted on here should really do a little homework before posting so we are not making GM waits even longer by wasting their time with our silly questions. As the post ALREADY states, and as is implied by the name, summer bass can only be caught during the summer months while winter squid is only caught during the winter months. Cataclysm was released in the winter, so it makes sense that you cannot catch summer bass for the achievement yet.. Yes, it is their job to answer questions. However, "Why can't I catch the Summer Bass?" is a very silly question when the malls are staying open 24/7 for holiday shopping. I mean... some people just need to learn to read, wether it be the quest/achieve text itself, here on Wowhead or another site like this. One says Summer, one says Winter. Even if you live in Cali and it's always sunny... It is still WINTER right now. There are posts dating back 4 years telling you that it is seasonal... even if you want to know when the months switch over to allow you to catch the other... It was DECEMBER when Cata was released, so why the hell would you ticket a GM now? No wait, I know, some places have different seasons ala Romance of the Three Kingdoms II where spring starts on Jan 1st and it's Summer where they are! Yeah, the Achiev was out in November..and I was one of the people hoping it really was possible to catch it (according to that post with over 40+ rating). I understand completely the Summer/Winter titles to them myself...but was sorta miffed at Angel taking a bite outta other people for ticketing the issue. Not to seem totally stupid, however, while I am not new to WoW or the Fishing, in an effort to get the achievement, I am running into different kinds of fish I never even knew they had. That being said, and again, not to be totally stupid, is there any place in particular that you need to go to fish for the Summer Bass, WHEN it is chronologically possible? Please! ug so you have to wait until March 20th? Spring Equinox? 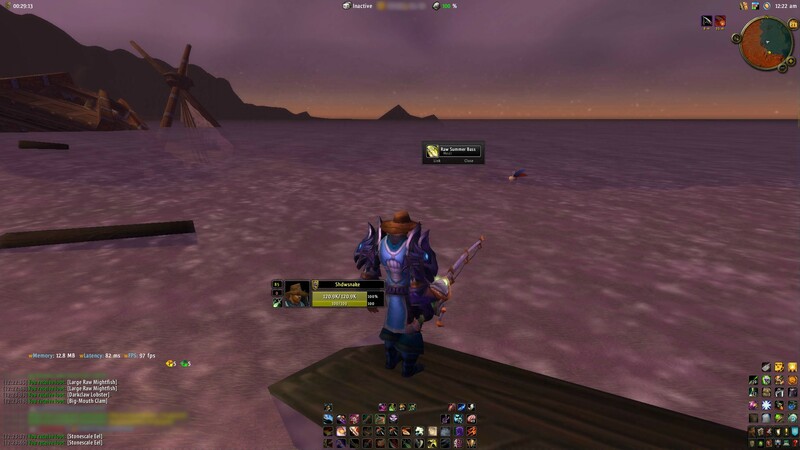 Fished 1st March 2011 at Shattershore, Blasted Lands 21.30-21.45 servertime. Thanks wowhead for the heads up ! simply yes wait for the 20. March and then get your achivement. Please stop saying this can be caught during all of March and all of September. "20 March to 22 September." Edit: Thank you for the correction! Check Blueheart's comment below for the correct times. I've been fishing for 30 mins now and still no Summer Bass. 12:15am server time on March 20th. I still got a winter squid, not a summer bass yet. Maybe after the dailies reset we can all get the achieve. if i can catch winter squid still..is that means no summer bass yet..? March 20th, 2011, 6:30 A.M. Server Time. After 6.5 hours of fishing, I am still only catching Winter Squid, and even them, few and far between. I am beginning to seriously doubt the claims that Summer Bass can be caught starting March 20th. I never really understood what credence I should have given to those claims anyway. I will keep trying every day, regardless. In the mean time I will bank my Winter Squid and mark them up big time to sell in August. I remember them being a fairly critical cooking leveling item at one time. Edit 2: It is after Midnight on server, just caught one..... So it is March 21, 2011 at midnight and not on the 20th..
3/20/2011 You receive loot: . Does NOT start the 20th of March. Edit: well if you're right then in 53 minutes I should be able to catch it.. I'll let you know. Summer equinox is March 20th, 11pm GMT. I came on here looking for information on whether or not the equinox was based on day or time... based on the fact I haven't caught one yet today, I gather it is based on time or Blizzard set it to start tomorrow. Yes the equinox is today... but it is at 23:21 this evening. Based on Wikipedia (not the best source of trusted info, btw) http://en.wikipedia.org/wiki/Equinox. I guess I'll be up late tonight checkin' this out. hehe Spring Equinox, you mean. Summer Solstice is in June. March 20th 19:55 - 22:35 GMT - Still catching Winter Squid in Azshara! Just caught one in Azshara, capping my profession achievements. Enjoy all! Just to confirm, caught a summer bass at the Blasted Lands, down by the Gilnean wrecks at 2307 GMT 20th March 2011: assuming that the server timer clicks over an hour ahead as it's in Paris so . . . . Anyway, one more achievment ticked off so GO GET YOUR BASS GUYS ! Edit: those in EU who got it, did so after 12: midnight their time, so it is likely something you can only get after your realm's midnight. Vrakthris: Give it a little longer, the North American bass don't start out as early as the European variety. Was this March 21st in your time zone ? I got my Summer Bass the 21. march in 2. caugh in Azshara. Make sure you've flown out over the water a ways and are actually in the area of 'Steamwheedle Port'. Finding a landing spot out there may be tricky (Even stranded goblins charge by the minute, yeesh) but you'll get your Bass. Just caught mine. Same spot, 16 casts. The summer bass is back in game! Caught mine today! Same spot, 16 casts April 4 1pm ST. Went to Alifar's spot in Azshara at (50.0, 42.1) last night and got it on my 6th cast. Then went to fish the Glossy Mightfish off the end of the dock outside of Gadgetzan and caught the Raw Summer Bass again on my 1st cast and the Glossy Mightfish only 5 casts after that. Was a lucky night for me. Both spots were around 9:15-9:30pm server. Blasted Lands has the best drop rate by far. Raw summer Bass are here went fishing off of Jaquero Island on a small point loc 57/90. I started at fishing 395 with a +30 Mastercraft Kalu'ak fishing pole on Airie Peak server time 3:05 pm untill apx 3:40 pm up to fishing skill level 400. 13x Summer Bass, 26x Spotted Yellowtail, 6x Rockscale Cod, 8x Firefin Snapper, 3x Big-Mouth Clam, 2x Stonescale Eel, 1x Glossy mightfish. 0x Grey Trash. Not sure if it is just a matter of bad luck, or server time (8 am server time), or something to do with patch 4.1.0, but i have had zero luck thus far after 100 casts. Not sure what happened to previous comment, but had 100 casts in this spot, and no summer bass (8 am server time), patch 4.1.0. It looks like the fishing loot table has been updated to be level appropriate for the zones in 4.1. However, so far my only evidence to suggest this is Azshara. Will investigate more..
is there anyone who catch this fish since the 4.1 patch ? Caught one today within 5 casts in Blasted Lands after hours of unsuccessful attempts in Azshara. So yes, they do exist post-4.1. After fishing in Bay of Storms for what seemed like hours, I was only receiving Rainbowfin Albacore, Slitherskin Mackarel, and other low leveled fish. I went ahead and flew down to Swamp of Sorrows and got my Raw Summer Bass on the second cast. Remember, if you are receiving Darkclaw lobsters when you fish, you are in the right area. If you are fishing up albacore and other low-levelled stuff, it is almost impossible to loot the bass. 25% droprate in Blastedlands; take the portal from org, fly directly south from there and start fishing at the tip of the red reaches. A friend and me both caught 1 each in under 4 throws. Tried in Blasted Lands - The Tainted Forest. It's on the shore near Surwich flight point. 438 casts, several days after work; no way to catch Raw Summer Bass there. Then I moved to Blasted Lands - Shattershore. Got the Raw Summer Bass from 6-th cast. Maybe worth to mention that those two points gave totally different kinds of fish. got 2 back to back in the spot. good tip ! Dakone, you rock. Got it second cast. Tried other places for hours. caught 6 after 12 casts may have been luck. so 50:50 chance for me. I was in Azshara at 73.89, 30.23 it was 2:50 est. Can't catch some too, since 4.1.0. Someone can confirm he catch some Raw Summer Bass since last patch ? It looks like they changed the loot tables for fishing. In Azshara, No Lobsters, No Summer Bass. In Tanaris, No Summer Bass. I would have to say that I was able to Catch the Summer Bass off the Coast of Blasted Lands, on Second Cast. This after fishing 20 min in Bay of Storms yesterday. I caught him at 1025, on Shadow Council. THANK YOU! I did exactly what you said and stopped as soon as I got to the water. Got my summer bass FIRST TRY! Thanks for the Shattershore tip, after trying for quite a few days in Azshara with no luck, just came to Shattershore in Blasted Lands and caught a Raw Summer Bass on my 3rd cast. 70/39 to be exact. Oh, and it was 11.10AM central time, as I do think time of day matters. Shattershore in Blasted Lands is your one stop shop for Summer Bass, Big Mouth Clams, Large Raw Mightfish, Stonescale Eels (pools and open water), and Darkclaw Lobsters. Lobsters have a great fish rate here. Good for alts leveling cooking also for that pesky 275-300 range. Don't mess with anywhere but Shattershore. It hit the three fish I needed within a couple of minutes. Fished in Azshara for hours and never hit a Summer Bass. Went to all the locations mentioned in this commentary. Went to Tanaris, hit a Summer Bass in 3 casts right off the dock. Azshara must not work for Alliance members. was just reading up on this 5minago and red El's guide- while flying to a fp to catch a boat to try my luck in Swamp of sorrows, i decided to stop at 73,90 in Dustwallow Marsh and cast. sure enough, i got it there. 73,33 In Ashara. Two casts to get it. I can also say that i fished for this a long time in Azshara, and read some of these comments and tried Blasted Lands...caught it on 3rd cast! Can confirm as of 1 September (Fall/Autumn) these are catchable in Swamp of Sorrows. Got 2 in 8 casts. This was only for 10 minutes and are rough statistics. I caught ZERO Raw Summer Bass. I didn't confirm this on the 22nd or 23rd but it looks like my information was in fact correct. I got the Oceanographer achievement, and I'm sorry to all who read my post too late. I tried to warn you. Guess you'll have to wait for another 6 months for the summer bass =( Good luck to all on the achievement! I can confirm it's the same for us here on WoW Europe. El's Angling dates for Summer Bass and Winter Squid are the same on both sides of the Atlantic. I can't comment on servers in the Southern Hemisphere, but perhaps a player from Australia or NZ could confirm that for us? I'm not convinced El's have all the Catacysm changes fully updated yet, as I've had a few things go slightly wrong where zones have changed level, but I'm sure that will be fixed as soon as people post their new findings. Despite that, the site remains an excellent resource, and is still my first port of call for all fishing knowledge. I'm on an Oceanic server and it's now Spring here. As of today (22 Sept) Raw Summer Bass is still catchable. Still trying for Winter Squid since it's the first day of Winter in the US. Oh, man, am I lucky I started these achieves today! Just caught a raw summer bass at 1:13 AM ST (3:13 AM Central) in Blasted Lands on Shattershore. Had the +5 hat with a +30 pole and a +100 lure, and caught it after 23 casts. I was thinking I might be one day too late, but it popped up just after I mentioned it to an achieve-hunting guildmate of mine. From what I read, you will need no-junk skill to catch this fish at night, and it may take longer than if you fish for it between noon and dusk. I would assume my catching it at this time means they'll be there until midnight this evening. Caught one first cast off the coast of The Blasted Lands. Summer Bass is confirmed to not be able to catch anymore this year, 2011. NOTICE: Just talked to GM regarding the open season dates for this item for the achieve the dates the Summer Bass is available is March 20th through September 22nd ONLY. Previous postings say October and/or December this is incorrect. Today is December 11th, 2011. I live in Australia. Summer Bass should run during the Oceanic Summer Season, on the Oceanic Servers. I guarantee that all oceanic players will agree! Why can't Skrillex get The Oceanographer. He keeps dropping the Bass. Please be aware for those on Oceanic servers, it appears that it must be 20th March in the US before you can catch this fish as I have just tried now when the server time reads 8:48am (This equals 2:48pm 19th March PDT). It's now half-past midnight on my server and I just got the winter squid. I was thinking that it might be after maintenance/restart since it's Tuesday but the log on screen isn't stating there is any. After restart I fished for 15 minutes. 2 Winter Squid, no Summer Bass. Why did we think today would be the day it switches? Just caught a winter squid off The Red Reaches in Blasted Lands. I'm betting that until the server restarts in a few hours, it will still be 'winter' season. Just spoke to a GM regarding times for the Summer Bass to start spawning. He couldn't give me an exact reply but did say " Well as far as I can see it should be soon "
I asked if a server restart was needed and his reply was along the lines of " But frankly, we dont do the time stamp thing, so you will have to give it a shot when you think the time is right "
Surely they must be coded in some way as they only spawn in Spring / Summer. He finished by saying " When in doubt, tomorrow at the time which the Summer Bass is turned on wont matter anymore I guess "
Still Winter Squid as of just now for me, PST server 6:32 AM post server restart. March 20 2012 9:34am EST catching Winter squid. Just confirmed by a GM that summer bass will be caught after tomorrows server reset which will be the 21rd of march 2012 :) People say the 20th because 20th of last year was a server reset. They also say the 20th because guess what, the 20th is the official first day of spring. btw, today was a server reset too. One of the follow up comments a few entries down might be the answer. Apparently Europe has its resets on Wednesdays typically. For this particular issue, its probably not a big deal. However they probably have a policy that ALL seasonal changes must occur in ALL realms the same day. This would ensure that NEW achieves dont go server first to one region vs another. Again, probably not an issue with this one, but probably just a blanket policy. With the ~5 hr time difference, i'd say that noon eastern north america Wednesday would be a safe time to check again. Hopefully in one day the summer bass will rise up and conquer the winter squid occupation of their sacred lands. Down with wintersquidopia! Long live summerbassville! As of 3:30pm (CDT) Winter Squid is still around, guess I'll be checking again tomorrow to see if I can get my Oceanographer achievement. GOT IT! :) Blasted Land, 70,45-26,45. 2012-03-21. CET 00:24, Scandinavia 4,5 hours BEFORE weekly reset. Got my ach. :) GL all. No summer bass yet caught a squid after about 30 cast. Just got it at Grim Batol (EU) before the server reset - 1AM server time. Still catching winter squid on US server . Maybe it will be midnight east coast time. After fishing from pools for about an hour, I gave up landed randomly in Tanaris by the waterdropped my bobber and PRESTO! Raw Summer Bass..Achievement: Oceanographer...so if your having bad luck from pools don't use em, lol. Can confirm the summer bass is now fishable. just after weekly maintance. 21 march 13.40 game time. got it on my first catch. Chill out guys... yesterday was 20th march and still no Summer Bass. Only Winter Squid. Hope today I have luck for this. Available now, caught mine on the shore of the Swamp of Sorrows, finally completing oceanographer! March 21st - Raw Summer Bass can now be caught. Caught the Summer Bass on March 22nd and finally completed the achievement. Caught it after 10 mins in Blasted Lands in OPEN WATERS. You do not need to fish in pools to catch a Summer Bass. Also confirmed what a few other posters have said that the fish is no longer vaailable in Azshara since it became a low level zone in Cataclysm. Fished there for about 30 mins and caught nothing. Caught this today in the open waters at 10:04 PM in Tanaris eastern border. Can confirm that this is still available on Oceanic servers. Just fished this up in Swamp of Sorrows 62,51 (server: Barthilas). "I caught you this delicious bass." Confirmed, just fished one on 69,39 on Blasted Lands after 5 casts. Since most of these posts are a little dated, fished this evening for a few. Out of 20 casts, i caught three. I am maxed out fishing and all others were decent catches for the area. AVOID fishing out of schools people. You can't catch anything except whats in the school. I hung around the two furthest north east points and had decent enough luck. Just to clarify for anyone who was confused about whether or not these are caught in schools or open water, they are open water. Don't get discouraged if you don't get one on the first, second or even third try. In the five minutes I fished along the shore of the Blasted Lands I caught 2 Darkclaw Lobster and 1 Raw Summer Bass. Remember the open season for Summer Bass is 3/20-9/22. :) Good luck! This fish should now be available (3/20/2013), but I'm still getting Winter Squid in the Blasted Lands. As soon as I get a Summer Bass, I'll never need to look at that orange-red wasteland ever again...hopefully. Still getting Winter Squid as of ~7:30pm server time. Qiraji Guardlings not spawning yet as well. What's going on this year? Edit: was fishing off the coast in Blasted Lands if that makes any difference. Not available to fish on March 20th as some comments may have you believe. Likely March 21st. Fished Winter Squid up at 8:50pm server time (6:50pm Blizzard time - PST) on 3/20. Winter squid STILL dropping on my server. WTF! After 12:01 am server time. So what? It doesn't change til after 3:00am or something? Winter Squid still dropping. If you tune to CNN in a few, you'll see see me... I'm about to go postal. Caught summer bass 3 AM Realm time! distracted or bored and never finished. Did the same thing in Cata too lol, never finished. Confirmed @ 03:53 Local& Server time @ coordinates The Blasted Lands 46,80, 89.97, Surwich Docks. 2nd Cast. I caught both Raw Summer Bass and Darkclaw Lobster at the Dark Moon Fair. I didn't see either listed on "Fished In" page. Another great reason why, When It's Summer in Kalimdor it should be Winter in Eastern Kingdoms and vise versa. Winter squid is still being caught on March 20th, 2014. I am doing it right now. Haven't caught any summer bass yet. I am fishing in Blasted Lands. Just caught a summer bass after my 5th cast in Blasted Lands at 69.36. I caught it on Shattered Halls server at 1:36 PM EST. This fish does not have to be fished up in pools.Good luck to all of you in search of this catch and happy fishing! I caught a Summer Bass in Blasted Lands at 1:34 PM EST on Shattered Halls server near the boats. For those of you who use coordinates, it was at 69,36. I caught it on my 5th cast. Good luck to all of you searching for this one and happy fishing! Today I have completed the Achievement Catching this Fish today from the coast of Blasted Lands. I have been waiting for Summer to Complete this Achievement and it is Finally Done. After one hour I caught one right now, on Swamp of Sorrows at 80,46. In case anyone is curious... 2015 Vernal Equinox is at 5:45 CDT. Just fished a winter squid so I'm going to try again after the official equinox to see if it makes the difference. I can confirm that Summer Bass is now fishable. I fished on the shores of Blasted Lands for 10-15 minutes, finally catching it at 12:15AM (EU Realm Time). Just found one about 72:52 just south of Lost Rigger Cove in Tanaris. You will need 290 fishing skill to catch this fish. You will need 290 fishing skill to catch this fish (wowwiki info). Edit: Just caught it with 283 total skill... So you probably need just 270-280 skill. Be sure you are fishing in and around the areas marked on the map here. I decided to fish from the farthest west boat at Surwich in the Blasted Lands (which is outside of the range of the pins on the map) and did not catch any bass for a good 30 minutes. I then changed position into the range of the pins and caught 3 bass within 4 minutes. So don't be like me and waste your time. This year judging by the callendar, it will go up to 23 of September, now it's 00:05 and got one. today down under is 1st June 2016, 1.15pm NSW time, at approx 67.5/62.5 I caught the Summer Bass, i saw 2 pools of Stonescale Eels, fished them up and stayed there for an extra 10 throws b4 i got it....now am off to get my Glossy Mightfish, my last,,,GL with ur fishing.. The next scheduled equinox for Spring is scheduled for March 20, 2017 at 10:28 AM UTC or 2:28 AM PST. Since March 20th is a Monday in 2017, odds are that Summer Bass will be available after the maintenance/reset on March 21st. Based on past events, the Fall equinox is scheduled for September 22, 2017 at 8:02 PM UTC or 12:02 PM PST. September 22 is a Friday in 2017. Therefore, safe to assume that the Summer Bass will not be available after Tuesday, September 26. However, it is important to note that Blizz may not allow the fish to be fished up after the 22nd of September. If this is the case, you would need to wait until March 20, 2018 since reset would happen on that same day! You can also find out the summer bass in the Forbidding Sea east of Light's Hope Chapel. That will cut down on the travel time for my paladin brothers and sisters. Only from March 20 to September 22 as mentioned though! If you're after a Raw Summer Bass to complete The Oceanographer, don't waste your time - leave it until server reset tomorrow, Wednesday 21st March 2018. After fifteen casts at fishing level 1200, I just caught a Winter Squid. On the plus side, if you haven't fished up a Winter Squid yet, go grab one, or it will be another six months before you can complete The Oceanographer! Confirmed with a GM, Summer Bass become available on March 20th 2018. Still haven't found one, but they are out there. Today... SW to Blasted Land portal. A few casts later and bam - done. From Orgrimmar to Blasted Lands and from there to Swamp of Sorrows. Out to where it says The Forbidden Sea on the minimap. First catch got me a Summer Bass. I caught mine March 21, 2019 at just after 1 AM server on Moonrunner. Happy spring! "Summer Bass spawns in the spring time and reaches maturity in the summer. This fish can be caught in those seasons." This item can be fished in Swamp of Sorrows (85), Blasted Lands (70), Tanaris (57), Azshara (51), Thousand Needles (18), Darkmoon Island (17), Badlands (6), Eastern Plaguelands (6), The Cape of Stranglethorn (4), Sunken Temple (2) and Northern Stranglethorn.